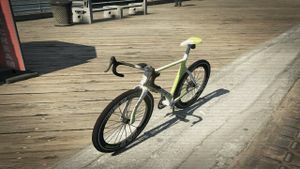 A Whippet Race Bike in GTA V.
The Whippet Race Bike is a bicycle in Grand Theft Auto V and Grand Theft Auto Online. One of the fastest bicycles in the game, it has a carbon fibre frame and alloy rims. Available to purchase from pandmcycles.com for $2,500. Sometimes located outside the De Santa House, with Jimmy De Santa riding away on the bicycle. Cyclists can be found along Route 68 with the bike. Available to purchase from pandmcycles.com for $10,000. A Whippet is a breed of dog, descended from greyhounds, who are known for their speed and agility. They are the fastest accelerating dog in the world and can reach a top speed of 35 miles per hour/56 kilometers per hour. The name may be a reference to the Whippet Express Coach company seen in Grand Theft Auto: Vice City and Grand Theft Auto: Liberty City Stories. This page was last modified on 28 December 2014, at 14:44.